Jun 24, 2014 @ 09:00 AM — by Sharon B. Mateja, D.D.S. If you have spoken with anyone regarding cosmetic dentistry or have performed your own research at home, you have probably encountered various treatment options, some of which seem to overlap in their uses. Dental bonding and porcelain veneers are often used to treat a similar range of aesthetic problems, although the procedures themselves are vastly different. As a result, patients are typically better candidates for one technique over the other. When you visit our Rancho Cucamonga dental office, we want you to know that you’re receiving the most appropriate and effective treatment available. As such, please take a moment to learn the primary differences between each of these useful cosmetic options. What Can Each Treatment Fix? Despite these similarities, however, bonding and veneers are not necessarily interchangeable. In most cases, dental bonding is a preferable treatment for smaller problems that a patient wishes to address simply. Larger or more complex problems are better concealed by veneers, due to the better durability and appearance of porcelain, as well as its ability to easily cover all of a tooth’s surface. Dental bonding comprises the application of composite resin over a tooth. The composite is applied in layers, as if the dentist is painting the tooth’s exterior. Each layer is hardened with an ultraviolet light before the next layer is applied, and the tooth is gradually altered in color and/or shape. Once an adequate amount of composite has bonded to the tooth, it can be reshaped to better conform to the rest of the tooth’s natural structure. Because composite is tooth-colored, it blends in well with surrounding tissue, but it may look more conspicuous for larger restorations. 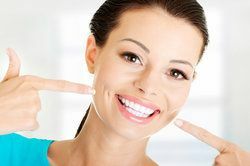 The benefits of dental bonding are primarily matters of convenience: the procedure is quick and painless in most cases, and requires no preparation. Composite resin is also less expensive than porcelain, and can easily be replaced or touched up in the future. Due to the precision necessary for crafting porcelain veneers, they are created in a special lab from impressions of your teeth, thus requiring a lengthier and more involved procedure. During your first visit, your teeth will be prepared via the removal of a thin layer of enamel. Impressions will then be taken of your teeth, which will be sent to an outside lab. In the interim while your veneers are crafted, you will be given a set of temporary veneers to wear over your teeth. When you are called back for the second and final visit, the permanent veneers will be carefully positioned and cemented over your teeth. Porcelain veneers benefit from excellent cosmetic qualities such as precise color matching and an enamel-like texture. As a result, most veneers are indistinguishable from natural teeth. With a full set of veneers, you can benefit from a complete smile makeover, hiding any number of flaws beneath. Moreover, porcelain is stain resistant and durable, able to last many years before replacement. When imperfections are large or numerous enough, veneers will likely be the clear-cut choice. However, there may be instances in which patients must decide between the convenience of bonding and the superior aesthetics of veneers. Depending on the nature of one’s problems and preferences, a combination of these treatments may also provide a reasonable solution. Ultimately, you should consult an experienced cosmetic dentist for a more personal analysis of which technique will better suit your smile. With a variety of cosmetic techniques available to you, it is helpful to speak with your dentist before deciding on any treatment plan. Contact us to schedule a consultation and exam with one of our knowledgeable dental professionals.